Jasmine Thai is located near the corners of Church and Grove in New Haven. Today I ventured out with Matthew Feiner for my first downtown New Haven high-wheeler ride. It was definitely challenging learning to maneuver the high-wheeler around traffic and pedestrians. But, I fared quite well and now am getting excited about the possibility of riding in the St. Patricks day parade next month. Enough about riding, this post is a food review. As a daily commuter I don’t always bring lunch with me to work. One of my favorite places to get good food at a great price is the Jasmine Thai cart near the corners of Church and Grove. Also, since the food comes from a cart I feel like they ‘commute’ their restaurant into New Haven each day. The food is all really tasty. There is usually a choice between 3 entrees. One spicy, one mild, and one vegetarian entree is offered each day. The entrees change day to day so there is always some variety if you go more than once in a week. With the entree you get a choice of Pad Thai noodles, drunken noodles, pineapple fried rice, or white rice. Also, I advise getting a piece of the grilled chicken with your entree. The grilled chicken is exceptionally tasty and the aroma of the chicken grilling with Thai spices draws people down the block to the stand. Today I got the Hot Basil Chicken with white rice and a piece of the grilled chicken. The Hot Basil was very good. A satisfying quantity of tender chicken was enrobed in an aromatic and flavorful spicy Basil sauce with pieces of tomato. The grilled chicken is fantastic. Seriously I would go there just to get a piece of the grilled chicken. It is that good. The rice was perfectly cooked, fluffy, and a little sticky like good white rice should be. With a soda the entire meal only costs $7.00. 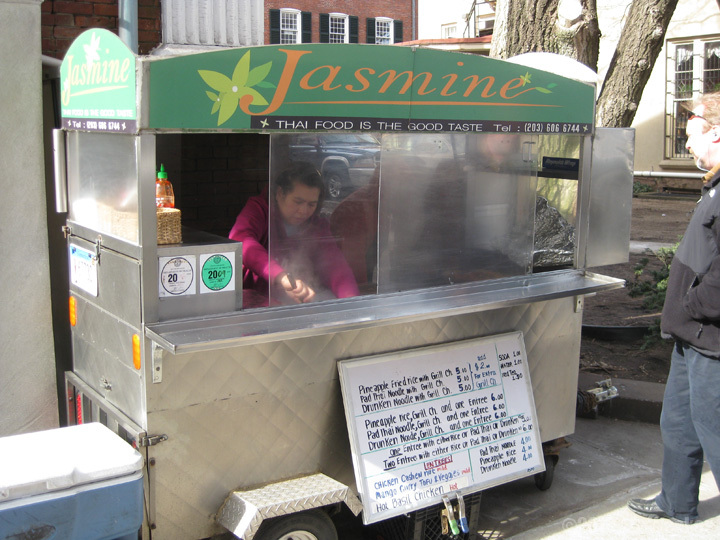 Jasmine Thai is a great offering for the downtown New Haven lunchtime scene. Whether you are out and about, on the go, or just looking for something to take back to the office, Jasmine Thai is highly recommended. The Devil's Gear high-wheelers in front of Jasmine Thai. The ElmCityCommuter aims to capture the enjoyment, further the knowledge, and enhance the experience of New Haven, Connecticut's bicycle commuter culture. 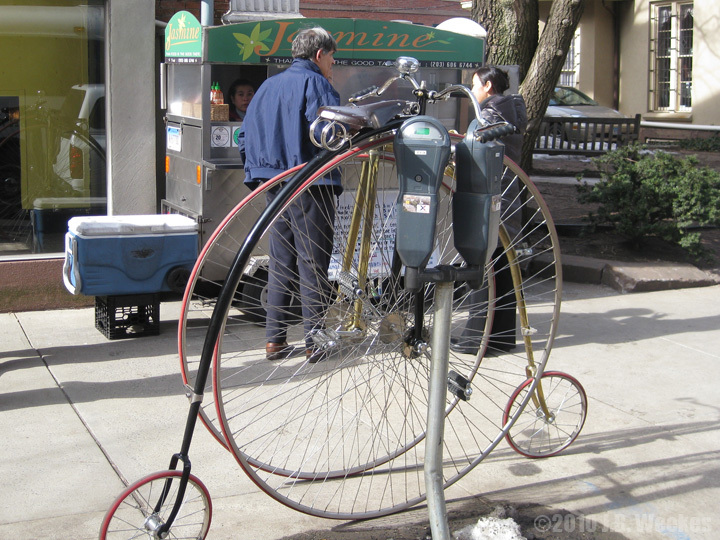 We hope to accomplish this through: reviews of bicycles and accessories, food reviews, how-to's, stories about New Haven cycling, and lots of photographs. Questions? Comments? Suggestions? Please, email me here: elmcitycommuter@yahoo.com. Thank You. Farmington Canal Trail high wheel bicycle ride.